I am a Toronto-based writer, editor, and layout designer specializing in boardgame rules, marketing content, and tech reporting. 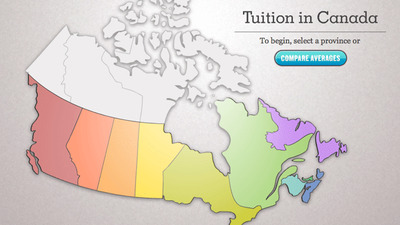 An interactive library of infographics allowing readers to explore how university tuition rates have changed across Canada since 1975. Hit hard by the recession, Canadians are saving more and choosing low prices over good quality, according to Bensimon Byrne‘s latest Consumerology quarterly consumer survey. Asked about purchasing priorities, two thirds of surveyed consumers said that “paying the lowest price” is very important. That’s up from a little over half of respondents who said the same in 2008. I have debt – a lot of it. Some nights I wake up in a cold sweat from nightmares about default and bankruptcy. Like many students, I dread the six-month anniversary of my graduation, when I’ll have to start repaying my loans and begin the long slog towards financial freedom. Those of us with debt will be living with it for a long time. But what does that mean? How will my debt affect my future, and what can I do about it?